Katie Grace McGowan's artwork explores empathy and affect. She engages in genre-bending performance, writing creative nonfiction, and working as an amateur private eye. 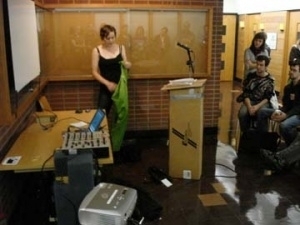 Her practice is rooted in participatory observation, or what Katie calls invisible theater, through which she explores ideologies different from her own. Her performative and literary work has been presented at George Mason University (Fairfax, VA), The Museum of Contemporary Craft (Portland, OR), Galerija Kortil (Rijeka, Croatia), N'Namdi Center for Contemporary Art (Detroit, MI), among others. Her residency history includes Craft Advanced Research Projects Agency| CARPA, (Joshua Tree, CA); Udruga Filmaktiv (Rijeka, Croatia); and Prostor Plus (Rijeka, Croatia). Katie holds an M.F.A. from The University of Iowa in Intermedia as well as M.A. and B.A. degrees from Wayne State University, in English. 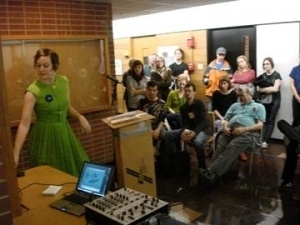 After a decade of working as an artist, educator, and writer in several U.S. locations and Croatia, Katie returned to Detroit in 2011 to collaboratively build the Department of Education and Public Engagement at the Museum of Contemporary Art Detroit (MOCAD). In this position she co-founded the museum’s DEPE Space residency program and helped launch and program the Mike Kelley Mobile Homestead, in addition to executing museum programming. Subsequently she has lectured at the College for Creative Studies and Eastern Michigan University, created and run an art consulting firm, and served as program director for the Ann Arbor Film Festival—the oldest experimental and avant-garde film festival in North America.